One of the main contributions of this important book is that it offers a thorough survey of the theoretical and empirical developments that have occurred in the area of (im)politeness in the different regions of the Spanish-speaking world, gathering together overviews by distinguished scholars. Additionally, the book advances the field with new empirical research on linguistic (im)politeness, and silence and (im)politeness, in a range of (non)institutional contexts, as well as new perspectives for the study of (im)politeness. A closing chapter by the editors provides an assessment of salient trends in the area and directions for future research. 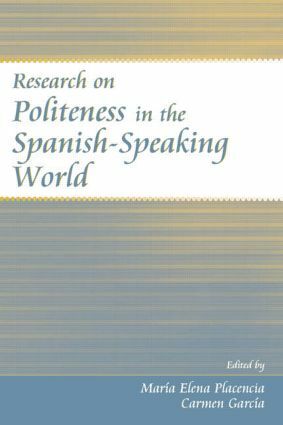 Research on Politeness in the Spanish-Speaking World is essential reading for students in Spanish pragmatics and Spanish linguistics, sociolinguistics, and discourse analysis. The volume is also very useful to English-speaking scholars in the general field of pragmatics who are not proficient in Spanish but require access to these empirical studies. Contents: Preface. Introduction: Models for the Study of (Linguistic) (Im)Politeness. Part I: Overviews of Politeness Studies. S.I. Recuero, Politeness Studies on Peninsular Spanish. L. Alba-Juez, An Overview of Politeness Studies on Argentinean and Uruguayan Spanish. M.E. Placencia, Studies on Politeness in Colombian, Ecuadorian, and Peruvian Spanish. C. García, Politeness Studies on Venezuelan and Cuban Spanish. C. Curcó, Positive Face, Group Face, and Affiliation: An Overview of Politeness Studies on Mexican Spanish. H.R. Cashman, An Overview of Linguistic Politeness in the Spanish of the United States. Part II: Empirical Studies of Politeness. Section A: Politeness in Institutional Contexts. N. Lorenzo-Dus, (Im)politeness and the Spanish Media: The Case of Audience Participation Debates. I.E. Carranza, Face, Social Practices, and Ideologies in the Courtroom. M. Cordella, "No, No I Haven't Been Taking It Doctor": Non-Compliance, Face-Saving, and Face-Threatening Acts in Medical Consultations. E. Ruzickova, Customer Requests in Cuban Spanish: Realization Patterns and Politeness Strategies in Service Encounters. Section B: Politeness in Noninstitutional Contexts. K.L. Fitch, Two Politeness Dilemmas in Colombian Interpersonal Ideology. C. García, Establishing and Maintaining Solidarity: A Case Study of Argentinean Invitations. Section C: Politeness in Intercultural Contexts. M. Schrader-Kniffki, Silence and Politeness in Spanish and Zapotec Interactions (Oaxaca, Mexico). Part III: Exploring Politeness From a Rapport and Identity Management Perspective. L.M. Fant, Rapport and Identity Management: A Model and Its Application to Spanish Dialogue. Part IV: Conclusions. M.E. Placencia, C. García, Salient Trends and Directions for Future Research.